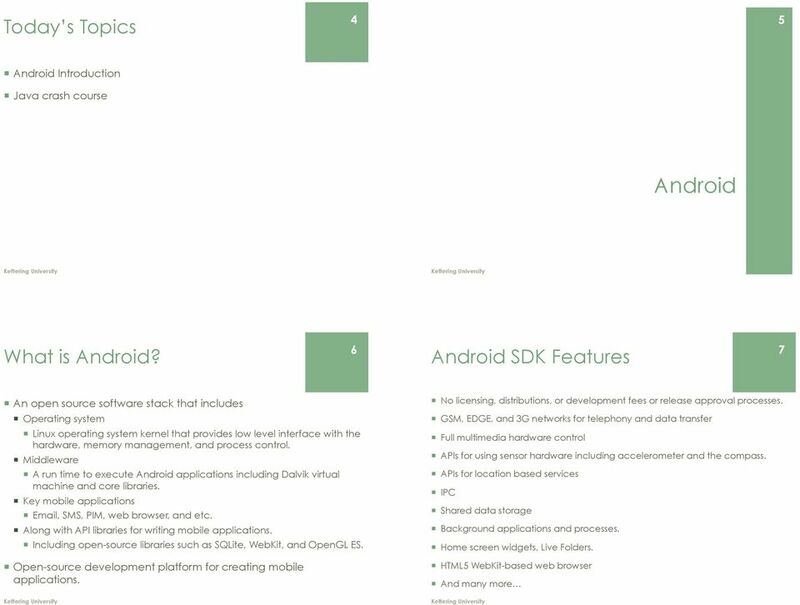 Download "Lecture 1 Introduction to Android"
4 Libraries 12 Android Run-time 13 A set of C/C++ libraries used by various components of the Android system. System C library Tuned for embedded Linux-based devices Media Libraries Based on PacketVideo's OpenCORE; the libraries support playback and recording of many popular audio and video formats, as well as static image files Surface Manager Manages access to the display subsystem and seamlessly composites 2D and 3D graphic layers from multiple applications LibWebCore A modern web browser engine which powers both the Android browser and an embeddable web view SGL/ 3D libraries SGL: underlying 2D graphics engine An implementation based on OpenGL ES 1.0 APIs; the libraries use either hardware 3D acceleration (where available) or the included, highly optimized 3D software rasterizer FreeType bitmap and vector font rendering SQLite A powerful and lightweight relational database engine available to all applications Android includes a set of core libraries that most of the functionality available in the core libraries of the Java programming language. Every Android app runs in its own process with its own instance of the Dalvik virtual machine. The Dalvik VM executes files in the Dalvik Executable (.dex) format. 14 Java 15 A programming language Syntax is very similar to C++ but different! 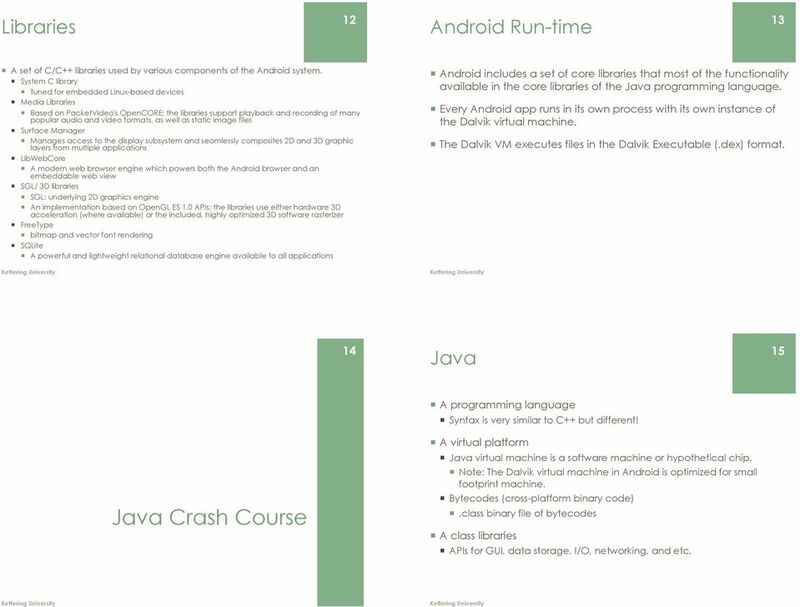 Java Crash Course A virtual platform Java virtual machine is a software machine or hypothetical chip. Note: The Dalvik virtual machine in Android is optimized for small footprint machine. Bytecodes (cross-platform binary code).class binary file of bytecodes A class libraries APIs for GUI, data storage, I/O, networking, and etc. 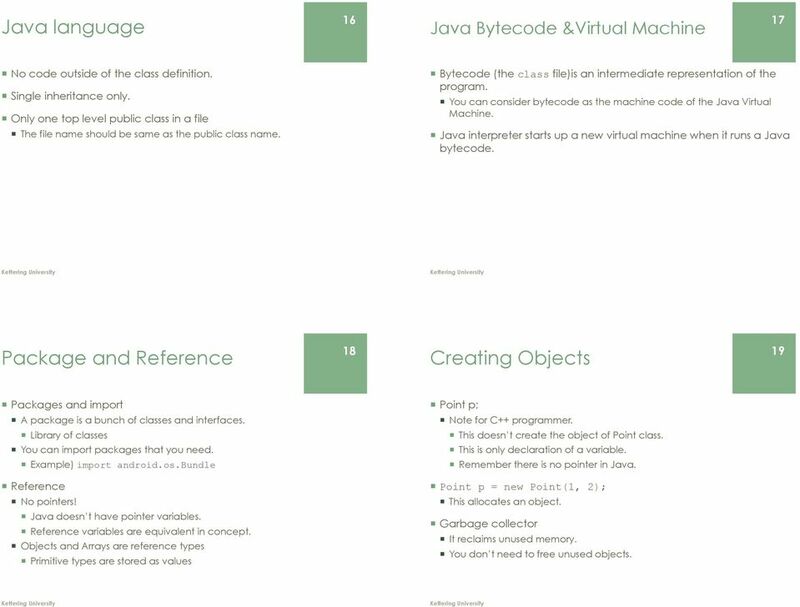 5 Java language 16 Java Bytecode &Virtual Machine 17 No code outside of the class definition. Single inheritance only. Only one top level public class in a file The file name should be same as the public class name. Bytecode (the class file)is an intermediate representation of the program. You can consider bytecode as the machine code of the Java Virtual Machine. Java interpreter starts up a new virtual machine when it runs a Java bytecode. Package and Reference 18 Creating Objects 19 Packages and import Point p; A package is a bunch of classes and interfaces. Note for C++ programmer. Library of classes This doesn t create the object of Point class. You can import packages that you need. This is only declaration of a variable. Example) import android.os.bundle Remember there is no pointer in Java. Reference Point p = new Point(1, 2); No pointers! This allocates an object. Java doesn t have pointer variables. Reference variables are equivalent in concept. Objects and Arrays are reference types Primitive types are stored as values Garbage collector It reclaims unused memory. You don t need to free unused objects. Android Application Development. 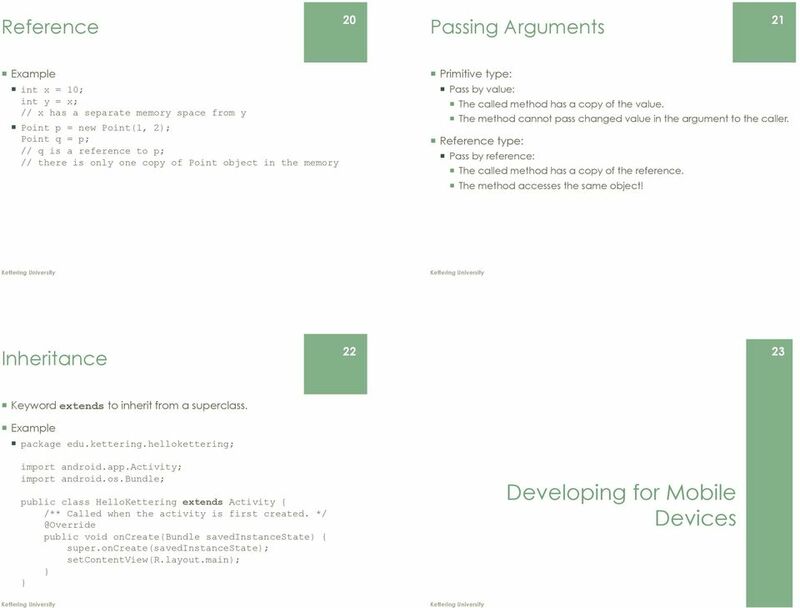 Daniel Switkin Senior Software Engineer, Google Inc.
SECOND EDITION Programming Android kjj *J} Zigurd Mednieks, Laird Dornin, G. Blake Meike, and Masumi Nakamura O'REILLY Beijing Cambridge Farnham Koln Sebastopol Tokyo Table of Contents Preface xiii Parti. 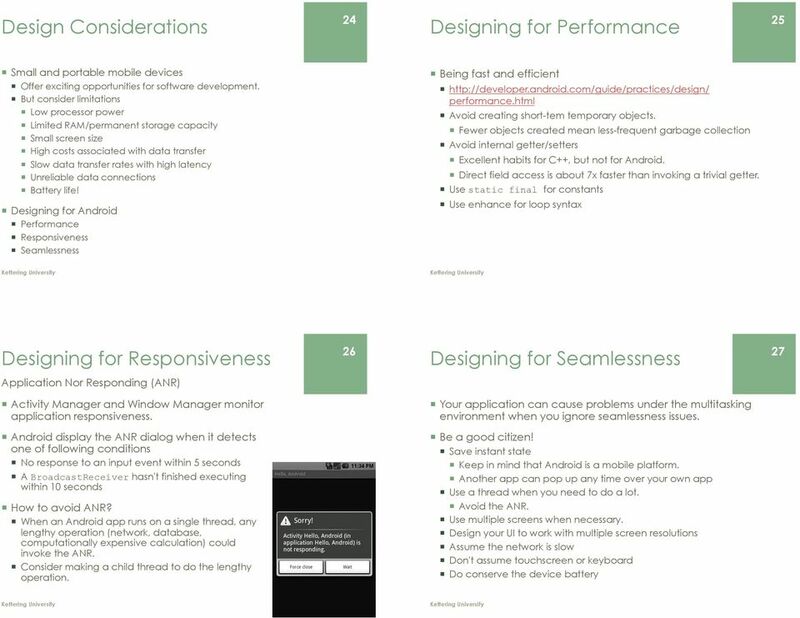 Google s Android: An Overview Yoni Rabkin yonirabkin@member.fsf.org This work is licensed under the Creative Commons Attribution 2.5 License. To view a copy of this license, visit http://creativecommons.org/licenses/by/2.5/. 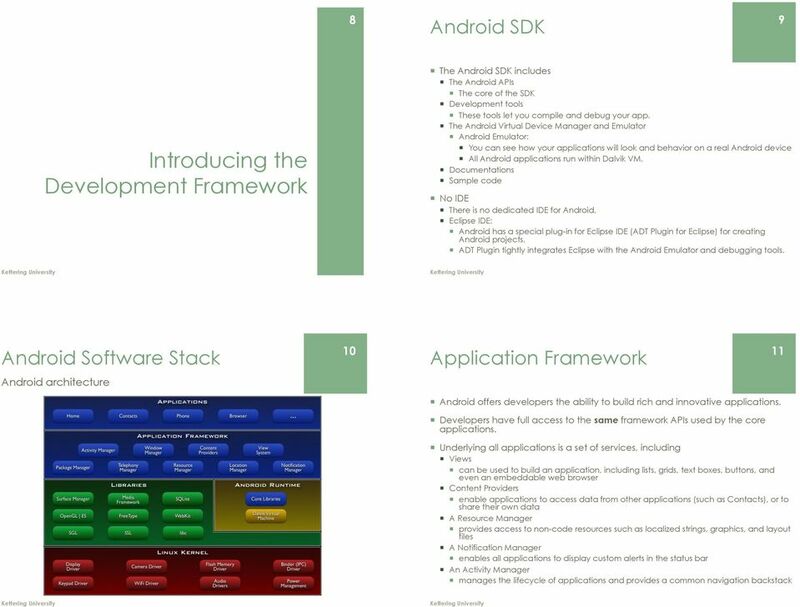 Android (Basic + Advance) Application Development You will learn how to create custom widgets, create animations, work with camera, use sensors, create and use advanced content providers and much more. 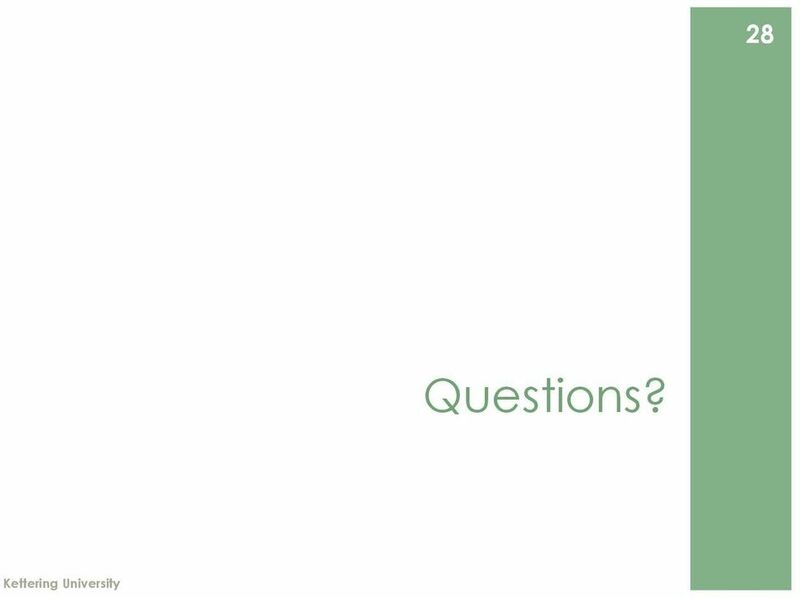 Que 1: Short question answer. 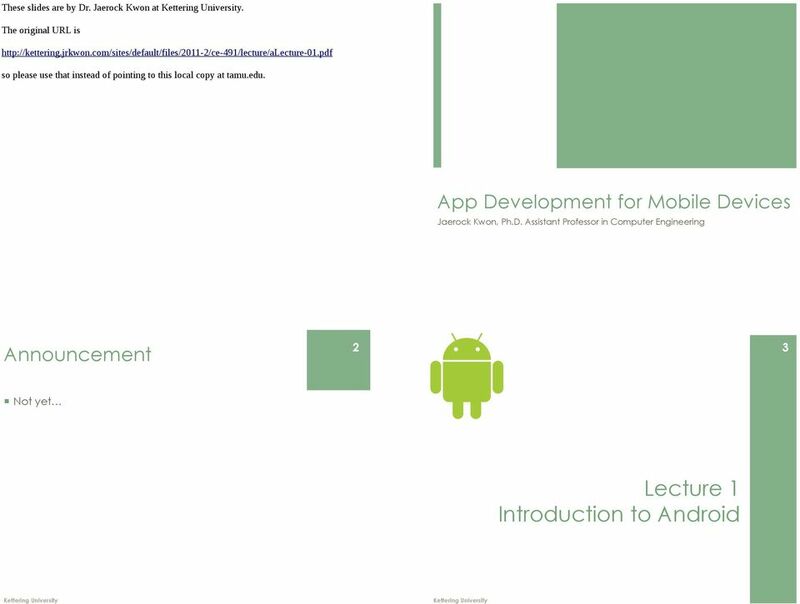 Unit 1: Introduction to Android and Development tools 1. What kind of tool is used to simulate Android application? 2. Can we use C++ language for Android application development? Overview. The Android operating system is like a cake consisting of various layers. Introduction to NaviGenie SDK Client API for Android Overview 3 Data access solutions. 3 Use your own data in a highly optimized form 3 Hardware acceleration support.. 3 Package contents.. 4 Libraries.